Four teams of students representing Yeshivah of Flatbush recently won high honors in this year's WordWright Challenge, a national competition for high school students requiring close reading and analysis of many different kinds of prose and poetry. Participating with 600 school teams from all across the country, the school's ninth and tenth graders both placed first in the nation in the year’s second meet, held in December. At the same time, the school’s eleventh graders placed fourth in the nation and its twelfth graders placed second in the nation. 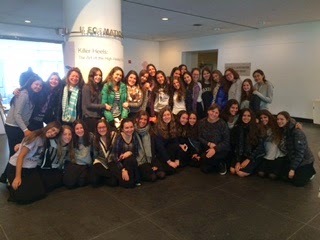 Students at the school who won high individual honors in the meet included freshmen Danielle Duchan (who earned a perfect score), Michael Feldman, Claire Lessler, Natanel Ben Shabat, Carolyn Kassin, Sam Tourgeman, Nancy Ades, Joseph Aini, Daliah Ben-Ari, Fortune Manopla, and Jessica Vaysman; Sophomores David Azrak, Joey Berkowitz, and Deborah Coopersmith (all of whom earned perfect scores), Joe Ben-Haim, Jacques Mosseri, Rachel Tbeile, Avraham Tessone, Shlomo Husni, Isaac Farhi, Joshua Salama, and Hannah Waide; juniors Victoria Gindi, Yola Haber, and Dylan Sutton (all of whom earned perfect scores), Gabi Cohen, Allan Bailey, Lily Betesh, and Aida Franco; and seniors Melissa Duchan, Louis Franco, Sarah Levy, and Gabriel Rudy (all of whom earned perfect scores), Nessim Azizo, Jackie Fried, Rashelle Gersh, Asher Lifschitz, Naomi Shapiro and Michael Zalta. More than 60,000 students from across the country participated in the meet. The students were supervised by Ms. Shifra Hanon. With heavy hearts, we boarded the bus to Yad Lakashish, our first stop on the last day of this year's Chesed Mission. As we arrived many of us were astonished, Yad Lakashish is an organization that provides the elderly with purpose in life. They are given a job and in return they give the elders money and food. We had a chance to walk around the facility and see the elders at work painting silk, pottery and beads. We also had a chance to talk to them and distribute make-up to the women, and scarves to the men. At the end of our tour we visited the gift shop to purchase the works of the elders. It was amazing to see what people would do to help the elders who would normally be home sitting doing nothing. After that, we headed towards Kever Rachel. As we sang the song Kol Berama, Rabbi Besser explained to us the meaning and context of the song. We learned about Rachel Emainu, how she was such a tzadekket and was always thinking of others before herself. When we arrived at Kever Rachel we each said a few perakim of Tehilim. As we left, I felt an atmosphere of chesed, and holiness. Next we went to an army base that houses over 50 different units, this base served as a training center. We went to the search and rescue unit, where we watched two videos about the unit. We observed a demonstration of a rescue, where we saw the steps the soldiers take in order to save a person's life. Then we boarded the buses and headed to Ben Yehudah street for some shopping and food before we sadly had to pack up to go back to America. We walked around and went to different shops to buy souvenirs for our friends and family. Following this we went to the kotel for a final "goodbye". We prayed Arvit with tears in our eyes and went back to the hotel where we saw a slideshow of all the pictures from this Chesed Mission. This trip was an amazing experience! It was my first time in Israel and I'm so happy I experienced it through this trip. We all went outside our comfort zones, learned how to forget our differences and unite through acts of chesed. Even though most of us are sad that the trip is over, we shouldn't be sad but we should use this experience as an inspiration. As most of know, chesed starts at home, and with all our experience we can definitely teach others and have an impact on society. We started off the 7th day of the Chesed Mission at the Emunah Ethiopian Day Care Center, one of the many Emunah day care centers located throughout Israel. This specific day care helps immigrant families who are struggling to adapt to Israeli society. We enjoyed the beautiful, sunny weather by interacting with the young children outside in their playground, blowing bubbles and playing ball. The children were so excited to play with us; the smiles and laughter flooded the area. It was evident that the day care staff appreciated our effort and support for their jobs, and the children definitely loved playing with us. Next, we went to Keren Or, a unique school for children with visual impairments as well as other multiple disabilities. Many of the children were completely blind and could not communicate with us, but nonetheless, we had a great time singing and dancing with them. The few children who were able to get up, dance, and even sing for us, definitely warmed our hearts. The music filled the ears of the children and our effort to interact with them didn't go unappreciated, even though the children couldn't say so themselves. The strong, stellar staff at Keren Or made sure we knew how much it meant to the children that we visited them as well as how much they themselves feel validated by our visit. At the Tel HaShomer Hospital, we were given the special opportunity to meet many inspirational people. First, we met with Avner Shapira, survivor of a recent firebomb attack and father of Ayala, who was more severely wounded in the attack. He answered our questions about the attack itself, his and his daughter's conditions, and their courage and will to move forward. He inspired me with his confidence that Israel is the safest place for him to be, regardless of the treacherous attack. The thought that someone who experienced such difficulty was able to persevere forced me to believe I can overcome all the comparably minute problems I face. After Avner, we heard from three IDF soldiers who served this past summer in Operation Protective Edge. They explained to us their positions in the army and answered our questions about the operation. When asked about their feelings when going in to the operation and the army in general, the soldiers simply answered that it had to be done; they have no choice. This idea made me believe that sometimes, there is no way out of situations, they must be dealt with. It seemed that this strong attitude is what keeps the soldiers going during times of danger. We truly benefitted from their words; their courage and humility inspired me to think more about possessing a strong, positive attitude. Finally, we handed out gifts to the children in various wings of the hospital. Many covered the general area, few went to the oncology unit, and I, along with some others, went to the eating disorders unit. Meeting girls my age who had spent the last year in the hospital inspired me to appreciate something I take for granted everyday, my ability to eat. I spoke to one girl who will be released tomorrow after 11 months of being in the hospital, to which I rejoiced. I could tell she was so grateful to finally feels well again. She explained to me the daily schedule and the schooling system, as well as the job of certain people that make sure she eats and doesn't burn too many calories. The resentment in her voice was quite depressing, but it touched me that she was so open with me and happy that she could finally leave. We started the day by visiting Aleh, an institution that cares for children with severe mental and physical disabilities. Despite their challenges, Aleh attempts to give them as much of a normal life as possible by engaging the children in activities such as singing and painting. I went to a room known as "technology class," where the children were given iPads and were able to play instruments using a special app. The way the teachers interacted with the children was amazing; they acted with so much enthusiasm, ensuring that every child engaged in the activity, even if they were hesitant in the beginning. I was paired with a girl named Shirley, and the way she smiled after "playing the piano" was absolutely amazing. After about a half an hour, we switched rooms, and I went to dance with some of the children. Although I was intimidated at first, after watching not only the teachers, but also the other students on the Chesed Mission interact with the children, I soon joined in. I can't even begin to describe how I felt when I finally got one girl to dance and play the tambourine with me. Afterwards, we went to Schneider's Children Hospital, where we went around giving gifts to patients. While it was upsetting to see so many children in the hospital, their attitude change was amazing when offered a gift . But it wasn't only that- the astonishment and gratitude of the parents when they realized not only that the gifts were free, but also the fact that we came all the way from America to give them, was amazing. Some of us went to the Oncology Unit, where one mother gave out bracelets in support of her daughter, who is fighting Leukemia. We took pictures wearing the bracelets and sent them to the mother, who told us how much she appreciated and needed the support. Next we went to Afikim, an after school program for at risk children. Each of us paired with a child from Afikim to complete an art project with them. I worked with an energetic nine-year-old named Noa whose comments and intelligence kept me laughing the whole time. After a short break, we then proceeded to visit an army base with Standing Together in order to give gifts and say thanks to the Israeli soldiers. We danced and sang with many of the soldiers. We also gave out hotdogs and drinks to uplift their spirits. After talking to some soldiers for about a half an hour, I turned around to see a soldier, Itzick, who I had met last year at a different army base. After getting over our initial surprise, we soon began to talk about what had happened this past summer, and when I told him that American Jews followed the news and pray for Israeli soldiers every day, he was shocked to hear of our dedication. It was truly amazing to see the shock and happiness on his face when he realized the level of dedication and connection that American Jews have for Israel, and how much we appreciate the soldier's service. And the level of excitement of Koral, a girl I had met last year, was absolutely incredible. For me, the excitement of the soldiers not only validated our trip to the base, but also, when coupled with today's trip to Aleh, really validated the entire Chesed Mission in general. Today the Chesed Mission packed food for the needy at Pantry Packers, empathized with the disabled at Dialogue in the Dark, interacted with children at Emunah's Achuzat Sarah Children's Home, and visited Israeli soldiers at an army base. We started with Pantry Packers, an organization run by Collel Chabad, that packages and delivers food to poverty stricken families in Israel (all with a smile). We were placed into groups and packaged rice for the needy in a high tech facility. We all left after a fun experience feeling good that we were able to be a part of the Pantry Packers mission of packing food for Israel's neediest. After that, we went to the Israel Children's Museum in Holon to experience "Dialogue in the Dark," which sensitizes people to the challenges of the blind. All I have to say is wow. I always sympathized with the blind, but today I empathized with them. I never realized what their life was like and what a struggle it is for them every day. It was a real eye opener. Then we went to Emunah's Achuzat Sarah Children's Home, a home for children who face many challenges at home. This was my favorite stop of the day. This home offers children-at-risk places to sleep, hot meals and most importantly, love and care for as long as they want. The Yeshivah of Flatbush girls were able to take part in an art project with the girls at Achuzat Sarah, while the Yeshivah of Flatbush boys played exhilarating games of soccer and basketball with the boys of Achuzat Sarah. Afterward we went inside for singing, dancing, and dinner. We ended our visit there with an amazing Bar/Bat Mitzvah celebration. Children from Achuzat Sarah who were celebrating their bar and bat mitzvah all received huge bags of goodies sponsored by the Yeshivah of Flatbush Elementary School Bat Mitzvah program and our Chesed Mission. This place had an incredible impact on me because these children were full of life and love. It really made me appreciate the loving family that I have. Today, we woke up with smiles and butterflies for the next day of the chesed mission. It was going to be our first Friday in Israel. Some of the girls woke up before sunrise to go to the Hadaya store. They picked out jewelry with Hebrew scripture engraved into each piece. We then went back to the hotel for breakfast. As per usual, we left the dining room with our stomachs full and waistbands stretching - we ate too much shakshooka again! We all gathered onto the bus and headed to the Michael and Lola Goldstein Emunah Day Care Center. The children come from needy families who need help to support and watch over their children. The center also provides services for parents in order for them to build healthy family lives. We interacted and played with them. We also blew bubbles with them, which the children really enjoyed. They smiled and giggled and lit up the room with happiness. Of course, it was contagious and before you knew it, we all couldn't stop smiling! We ended off the visit with delicious desserts made by the wonderful women that work at the center. The 13th annual Chesed Mission took off on Tuesday night, January 14th for a non-stop chesed experience in Israel. A group of 47 students and 5 faculty members, led by Rabbi Naftali Besser and Mrs. Susan Franco, decided to spend their winter break in Israel visiting the sick, dancing with soldiers, volunteering in soup kitchens, interacting with special children, and so much more. We were all so excited to finally be in Israel for a trip we've been waiting a long time for. We gathered our luggages and headed straight for the kotel to pray Arvit. It was a very meaningful and holy moment for all of us. For some of us it was our first time in Israel, so we were beyond excited. These students kissed the floor by the kotel to express their excitement. One of these students, Junior Victor Zalta, said "just seeing the kotel for the first time was a very spiritual experience." We then checked into the Inbal Hotel and then went to Emek Refaim for dinner. We then went back to the hotel to pack bags of clothing for the soldiers we will visit on Saturday and Sunday night. It was a great start to a trip that I know is going to be great! I am looking forward to the many days of chesed ahead. Chanukah is a time where the Jewish Nation celebrates its victory over persecution. It was more than a physical perfection, but an attempt to wipe out the Jewish Religion. Only through Achdut, unity, were the Chashmonaim able to overcome such large obstacles. On Thursday December 18, 2014, 26 Kiskev 5775, the Yeshivah of Flatbush SGO, in attempt to embrace the Achdut, ran its annual Chanukah Fair. It was a time for teachers and students to come together in a non-classroom setting and to bond. These activities included karaoke, teacher vs. student basketball (for both boys and girls), Banana-Grams, cupcake decorating, and so much more. "This was the best fair yet!" said Albert Dweck of the junior grade. We were happy to see teachers, faculty, administrators and students participating together in all the activities. A special thank you to Mrs. Sarah Marcus and Jennifer Anteby for helping to coordinate the event. We would also like to thank the teachers and administration for not only being so supportive, but for participating in the event and making it the success it was. Students from the Yeshivah of Flatbush recently had the privilege of volunteering in SBHs "My Grandma's Closet" fashion show. This benefit celebrated and honored the matriarchs of the community. 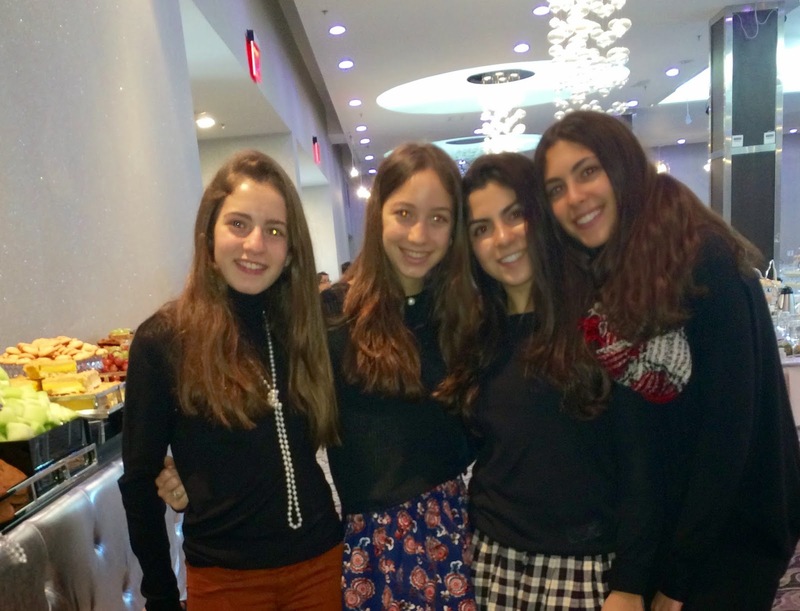 The students' contribution to the event gave them a sense of doing chesed, while still having a great time!